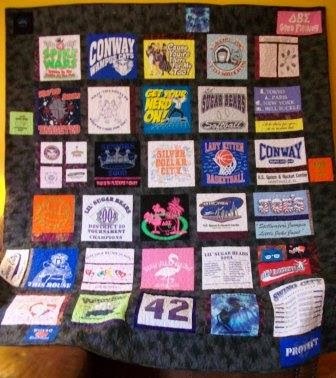 Madi's T-shirt quilt is finished. 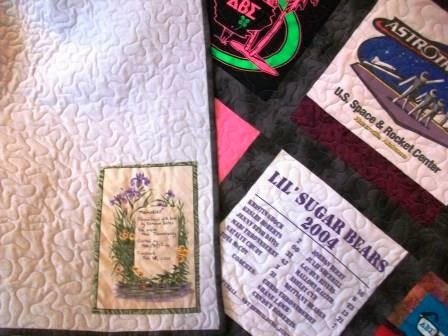 I did the machine piecing and the binding, but the machine quilting was done by Peg's Quality Quilting. She has always done good work for me. The finished quilt measures 85 in X 96 in. This one shows some of the detail. The back is a soft gray cotton fabric with a label with the quilt details (who pieced it, who it’s for, who quilted it, when it was finished). A few weeks ago I bought several skeins of yarn from an estate sale. I am now trying to find projects to make using the yarn which will only need the amount I have. All the yarns are now discontinued so I will have a difficult if not impossible time getting more if I'm not careful. These two projects were made using some of the yarn. The first one I call the "winter blues" scarf as it was knit during some of the not so nice winter snow and ice that came through. The yarn is Classic Elite Yarns Fame. I had about 1.9 skeins. 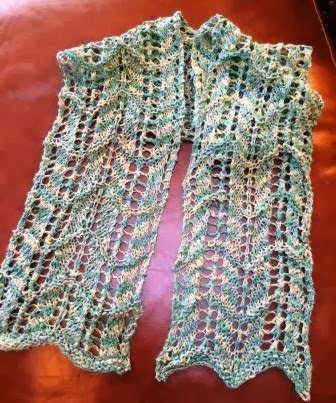 The pattern is Rainbow Arches Pooling Stole by Gladys We with far fewer stitches so the scarf is narrow. It measures 7 in X 58 in. 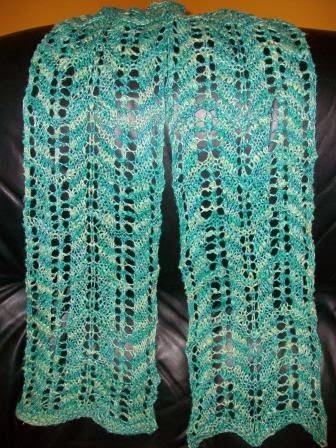 Here is another view of the scarf. This hat using some blue yarn of unknown fiber. I think is a cotton blend. 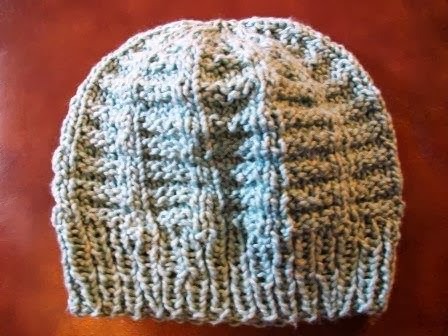 The pattern is Hermione's Globe Hat by Margie Mitchell. 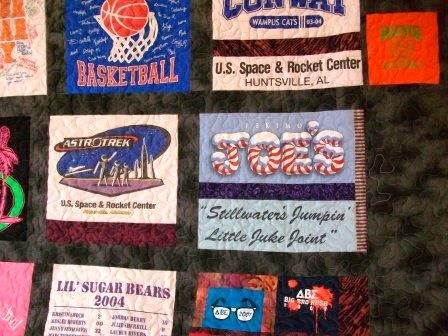 This quilt top was made from the T-shirt tales from my niece's shirts used to make her memory quilt. The blocks are 4 in square. The sashing is 2 in wide and placed in a basket-weave fashion. The border is 4.5 in wide. 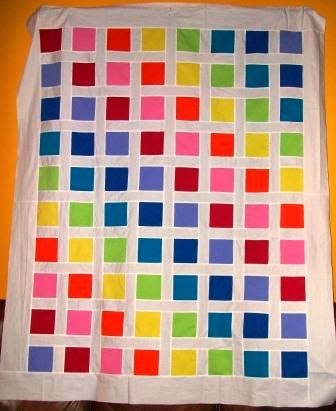 The top measures approx 55 in X 67 in. 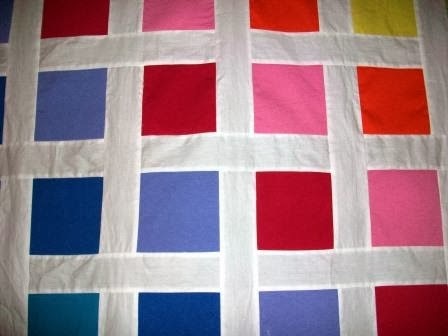 I'm still trying to decide how I want to do the quilting. You can see the basket weave of the sashing better in this photo. 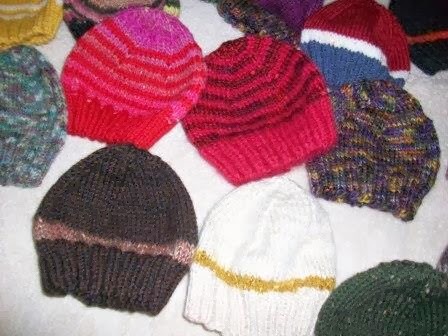 After Christmas I started knitting preemie to teen size hats using the left-over yarns from previous projects that were overflowing my basket. 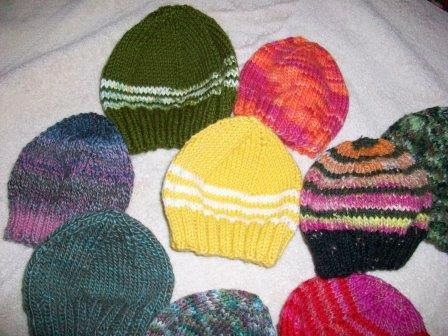 I stopped at 24 hats though I didn't manage to use all the yarn. 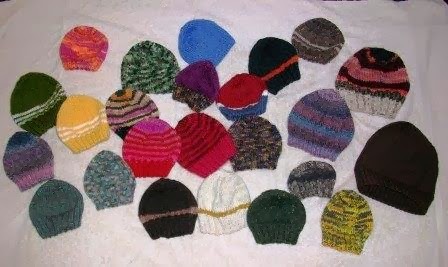 These 24 hats were donated to my local children's hospital through their "knitting for noggins" program. I used a basic pattern for all of them. Here are a couple of closer shots. This winter has been very cold, so I hope the hats can be used.